Yes I know the title should really read “just deserts”, but the misspelling (deliberate this time rather than my usual mistake/laziness) works for a place that sells desserts and little else. With the season of cheap, disgusting chocolate (calling the stuff in most Easter eggs chocolate is a breach of trade descriptions in my view) upon us, it seemed an opportune time to give my two penneth on a place that is designed for those who crave a bit of the white powder (sugar – although given time it may be regarded as as heinous as the other white powder stuff). I am not generally someone with a sweet tooth, preferring a starter to a dessert if I have to choose (I would of course have both if given the choice). People in my office may dispute this professed lack of a sweet tooth mind, on the basis that I will demolish any cakes that are brought in (in my defence we have two very good and prolific bakers in the team). 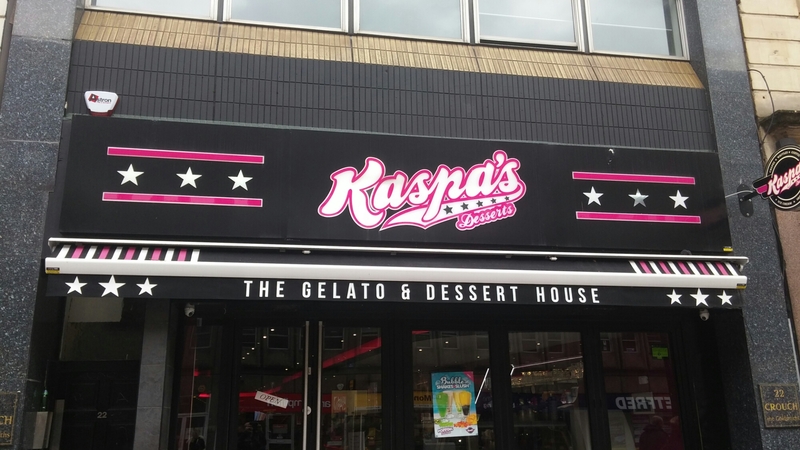 A visit (not my choice) to Kaspa’s (an American style ” gelato and dessert house” in Cardiff City centre) to bid farewell to our current trainee (they get to choose the venue – something we may have to revisit) didn’t, as a result, exactly have me jumping for joy. I am sure this sort of place appeals to the kids (and we wonder why we have a child obsesity problem) but for an old duffer like me it all looked a wee bit sickly. 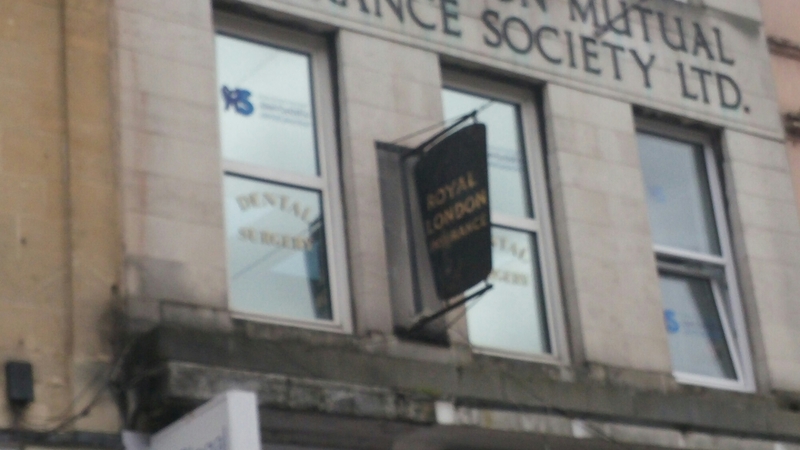 Is it a concidence, I wondered, that there is a dentist just 4 doors down from this place? Looking at the menu I worked on the assumption that all my teeth would instantly drop out the minute I entered the place. 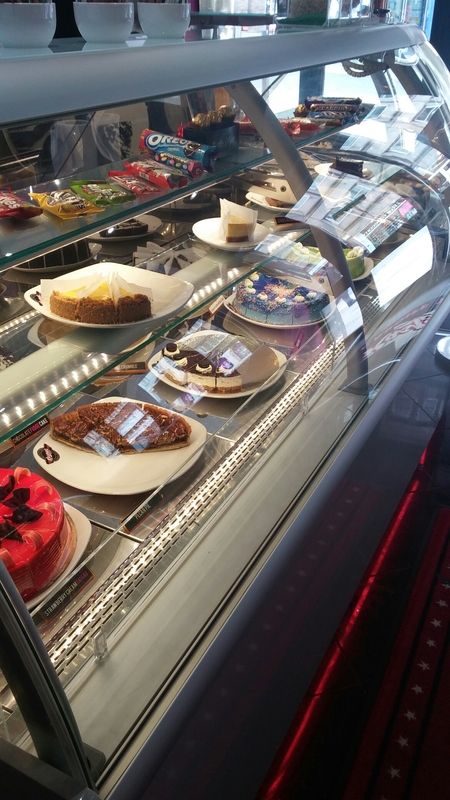 Despite my misgivings, I am very fond of Science Cream (love a bit of geekery with my desserts) in Cardiff and adore Nata & Co (and their amazing Pastel de Nata), as well as the patisseries at Cocorico Patisserie. 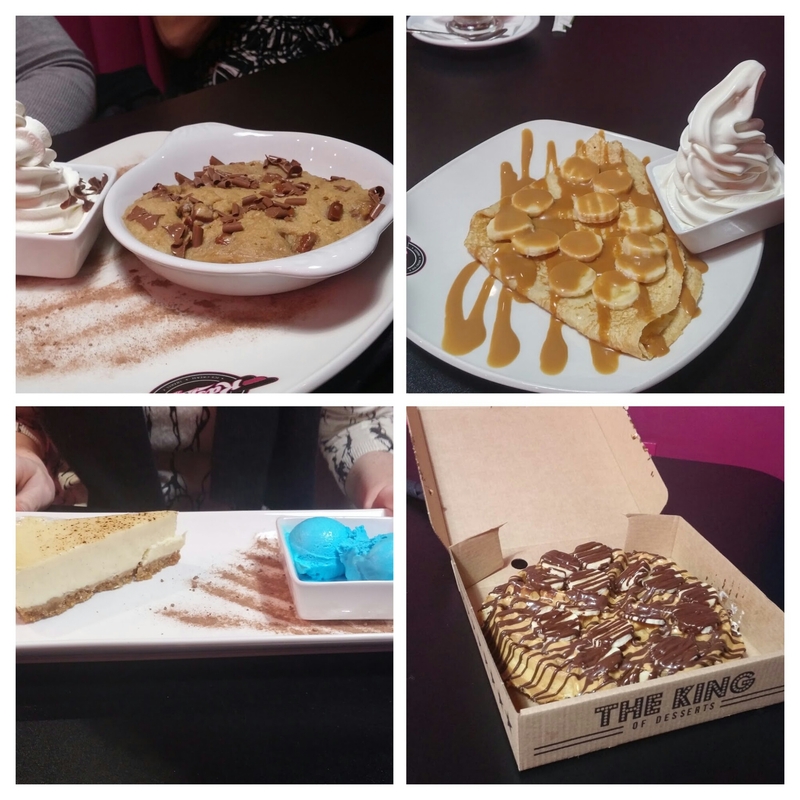 It cannot, therefore, be said I am totally adverse to all dessert orientated places. On this basis I went with a relatively open mind (well as open as it gets for a curmudgeon like me i.e. not very), hoping to be pleasantly surprised. The fact that their website states no GM and that all their products are handmade and imported from the heart of Italy with no artifical preservatives gave me some hope. I naively imagined that meant an old Italian Mamma working away in a tiny rustic kitchen in the heart of an ancient Italian hill top village. Here, I am sure, she would have a hair net on and be working in a factory at least the size of a football pitch. Well it is pink, very very pink!!! I think it is called bubblegum pink and suspect it is aimed at pleasing their target market. Seems to work, as the place was populated by predominately young people (mainly girls). Sterotyping by me l know, but it was. I felt very old in the place. 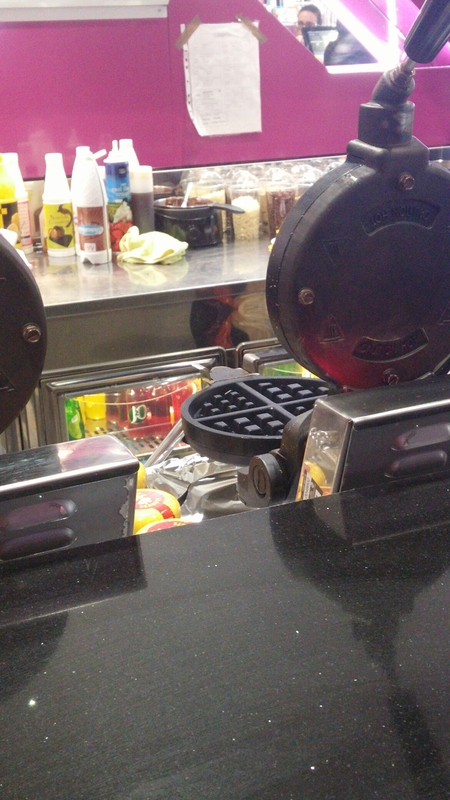 and rows of waffle makers. All very clean, but not my kind of place at all if am honest. Based on the type 2 diabeties inducing nature of the sugar laden menu, I was slightly surprised not to run in to Jamie Oliver outside organising a flying picket of the place. 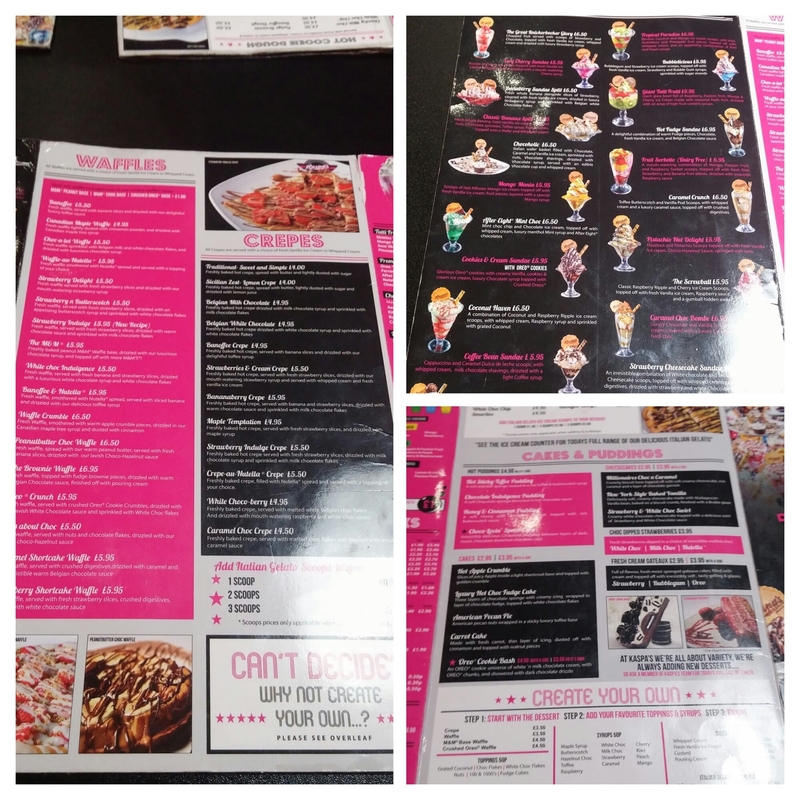 On the food front, the menu is split between ice cream sundaes, waffles & crepes, cakes and puddings. You can add all manner of further sugar laden stuff if you so wish. This extends to nutella, M&Ms and probably a bowl of sugar if you asked. I wonder if this will be how the sugar tax will be cirvumvented (which I learned to my horror may apply to tonic and thus G&Ts – grrrrr). Like the old Smiths Salt ‘n’ Shake crisps (need to be my age to remember these, although I think they still sell them along with probably rhubarb and custard flavoured ones – no more ridiculous than some have seen such as the gawd awful sounding Gin and Tonic flavoured ones from Aldi for instance), they could simply sell diet sodas stuck to a free bag of sugar for you to “voluntarily” stir/pour into your tax free soda. Anyhow I digress, so back to the food. After much “oh God what do I order” I decided on what I thought sounded like the most virtuous thing on the menu. 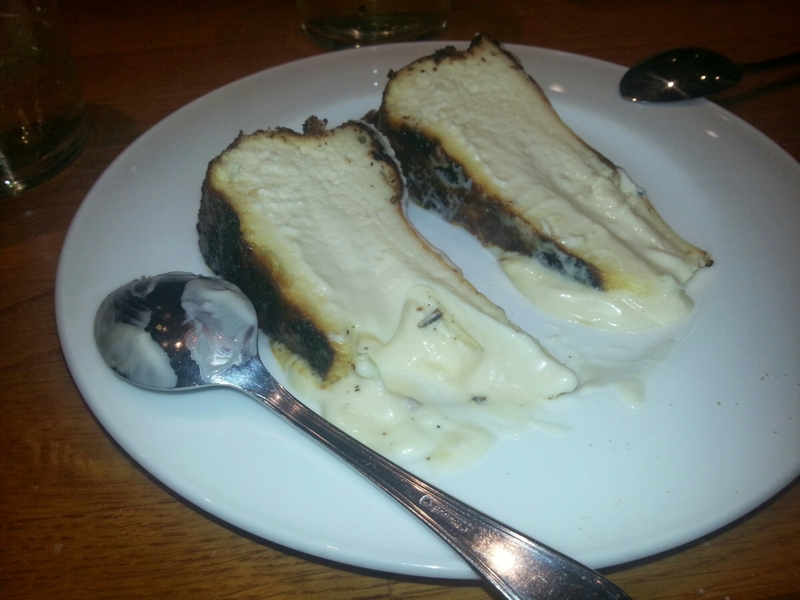 It was labelled as a New York baked cheesecake (£2.95), with a brulee glaze. 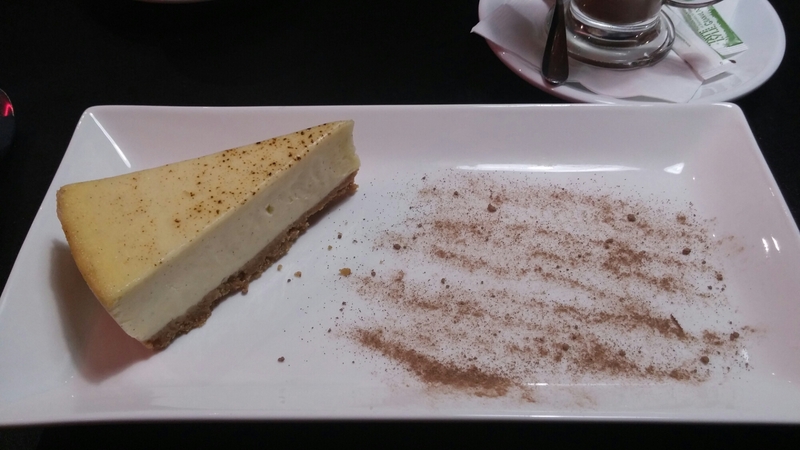 Whilst OK (it didn’t really taste of anything – lacking in the promised vanilla – so nothing to actively offend the taste buds), it didn’t look at all like it had been baked, lacking that drier, more crumbly, texture of a baked cheesecake. We did query its baked nature, but were assured it was. I still have my doubts have to say. Others went for progressives more sugar laden items. Chocolate chip cookie dough (£4.95) looked like a cowpat (but I was told it tasted nice – looked tooth achingly sweet to me) and I just thought the waffles (good size) needed bacon or fried chicken (with maple syrup, of course) on them rather than the slick of chocolate sauce (£5.50) they came with. A banoffee crepe (probably the worst value, to my mind, of all stuff ordered) came in at a hefty £4.95 for a pancake, half a banana and some toffee sauce. 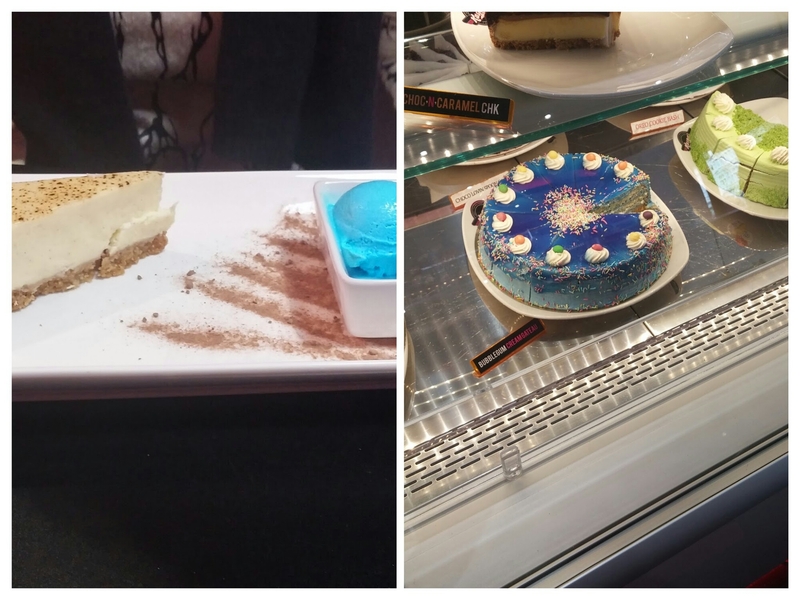 One item ordered was bubblegum ice cream ( an extra £1, I think, when ordered with a cake) which was a very alarming shade of blue (I also clocked a blue cake on the counter). There is a reason why plasters in kitchens are blue and it is because there are very few naturally occuring blue food. This means you can find it easily if it falls off. This stuff looked somewhat unnatural, something that always puts me off. Not going to find a blue plaster if drop it in that lot are you. Two of our party ordered the blue bubblegum ice cream and age seemed to be the determining factor as to whether they liked it (older no, younger yes). as well as smoothies and various hot drinks. 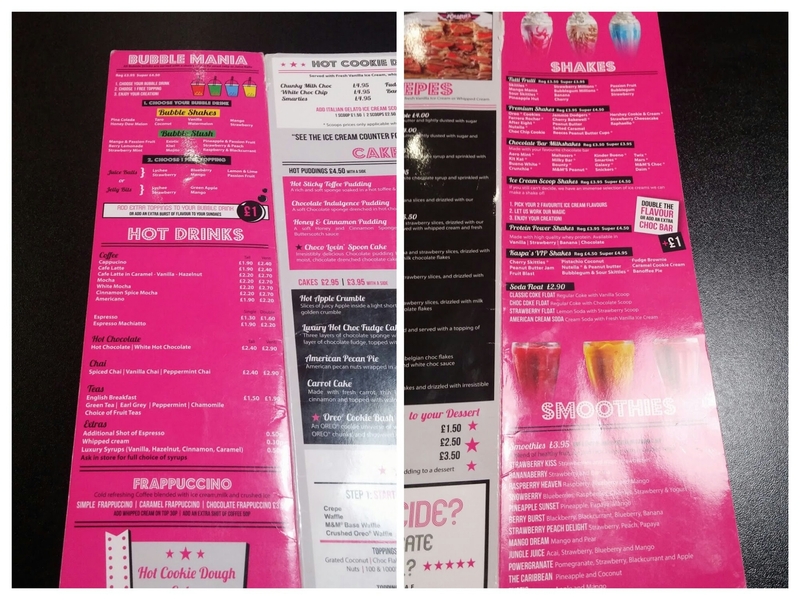 Shakes seem to be the place’s key offering on the drinks front and you can add all manner of extras to pimp up you shake. Chocolate bars, biscuits, sweets – you name a sugar laden item and you can undoubtedly add it to make your shake here. Probably could get a hollowed out Mars bar as a straw, if you wanted (I made that up). All a bit too much for me, but again I am sure the kids love this sort of thing. 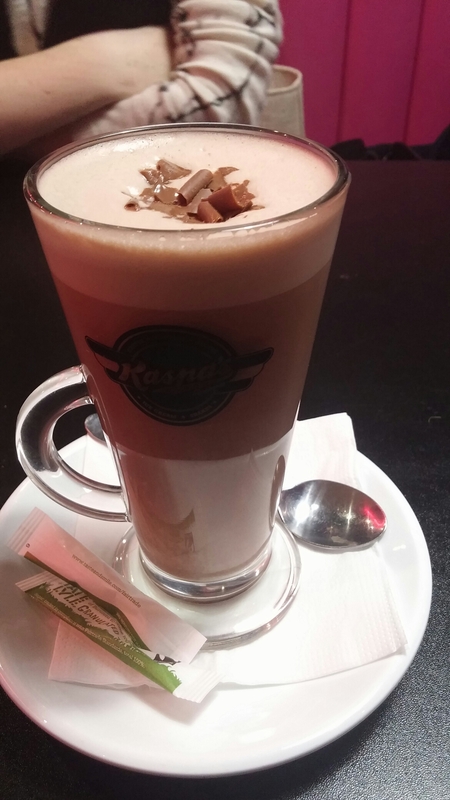 There are also hot drinks (tea and coffees and hot chocolate) and I decided on a hot chocolate (£2.40 for a small – I refuse to call it “tall” even though it is referred to as such on the menu). I like my hot chocolate rich, dark and a touch on the bitter side. This was none of the above, but manage to be not too sickly sweet. Luckily they do not add any whipped cream to it (seemingly obligatory on everything else). Cost wise the bill came to around £45 for 7 of us (all of us having hot drinks rather than the more expensive option of shakes etc.). OK value if this is your sort of thing I suppose. If you load up on “extras”, which I am sure the kids would do if given the chance, the cost would I am sure mount up very quickly. Sugar free tonic is the way to go. 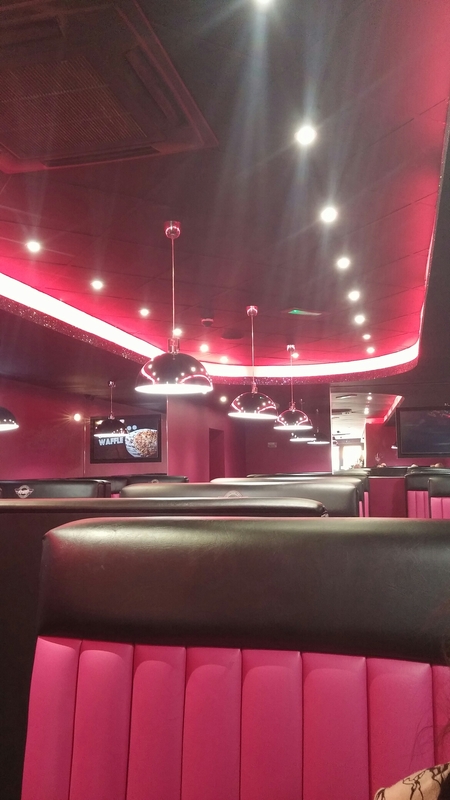 This entry was posted on Mar 27, 2016 by solicitingflavours in Cardiff, Cardiff restaurant, coffee, desserts, Drink, Food, Food and wine products, Ice cream, lunch, lunchtime, milk shakes, New restaurant Cardiff, Non alcoholic drink, Restaurant Review, retail, review, Wales.